Slots are popular, this is something that is comfortably understood throughout the iGaming world. Technological evolutions over recent years such as HTML5, 3D slots, and the rise of mobile gaming (not to mention VR becoming a reality in the slots word) has meant that this game type is bigger than it ever has been. 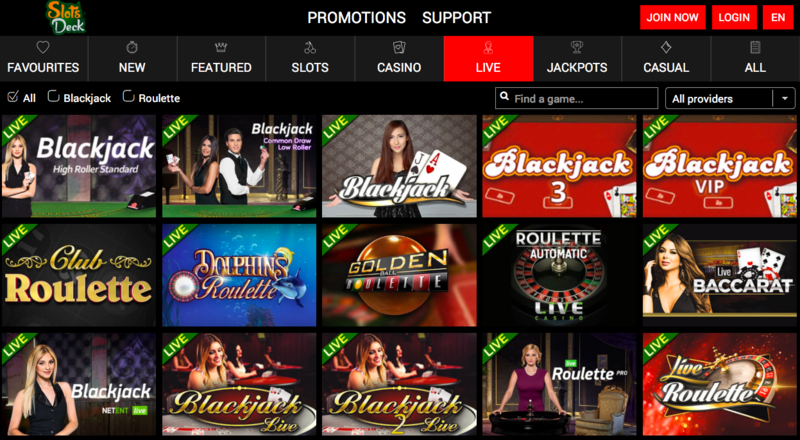 It is, therefore, no real surprise that many online casino sites have decided to use the concept of slots as part of their design, name, and more. However, there is a necessary balance to strike, and that is the balance between ensuring that players know that you provide slots, and players thinking that slots are all that you provide, it’s a subtle difference, but one that can be costly. This is an issue that Slots Deck find itself with, as not only does its name suggest a slot-only attitude, the slogans of “Play Online Slot Games” and “Free Slots No Deposit” don’t exactly work against those assumptions either. This is an issue, especially because slots aren’t all that Slots Deck provides, they have a decent mix of other game types too. 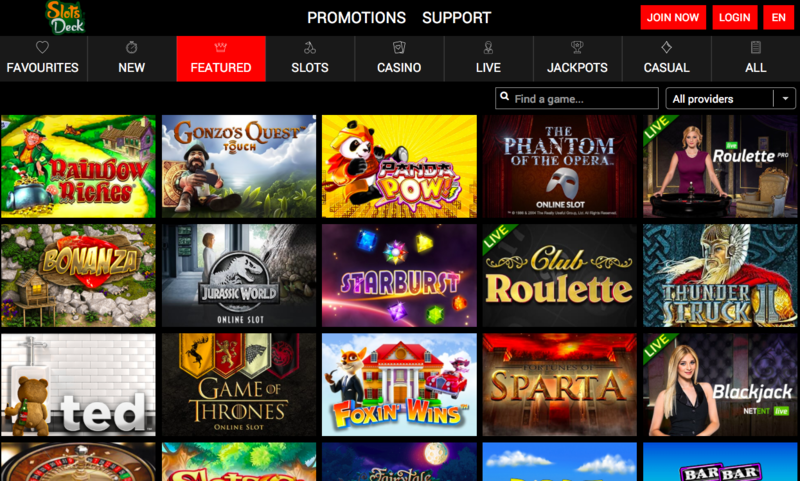 This doesn’t have to be a disaster though, we’ve seen other sites with similar marketing strategies find great success, so does Slots Deck look capable of following in their footsteps? At the time of writing, the first slot that you are shown when arriving at Slots Deck is the entertaining Mexican-themed Taco Brothers, which is sensible, as the colours of the Mexican flag, being green, white, and red, are also those included in the Slots Deck colour scheme. Okay, so the red is more orange here, but that’s also true in Taco Brothers, create g the question, when the feature slot changes, will the colour scheme of the site do so too? Probably not, and indeed hopefully not, because, as simple as it looks, Slots Deck has a very pleasant design to it. There is one problem, however, and that comes if you do not have your browser on maximum when viewing the site. The block of green that provides the background to much of the information here is fine in full screen, but on a smaller screen it becomes a half green, half white background. This would be fine, apart from one important issue, the writing is white. Hopefully that little glitch will be fixed, past that, the design looks great, and navigation is very simple, which is always useful. When it comes to the number of games on offer for their players, Slots Deck have not come to play games, with titles coming from a truly impressive list of software developers that includes 1X2 Network, Betdigital, Big Time Gaming, Blueprint Gaming, ELK Studios, Extreme Live Gaming, Gamevy, Genesis Gaming, iSoftBet, Microgaming, NetEnt, NextGen Gaming, SG Digital, SG Gaming, and Thunderkick. As mentioned above, slots aren’t the only choice here either, with a sublime mix of table and card games on offer, as well as a handful of scratchcards. Slots are clearly the focus though, and you’ll find a wide array of video slots from old favourites like Starburst and the aforementioned Taco Brothers, to newer releases such as Bonanza, and a host of jackpot slots as well. With all titles available to be played for free in demo mode before you make any deposit at the Slots Deck site, you’re also able to take the time to find your way around before deciding whether this is the site for you, a nice touch. Nice touches are what this site does, when it comes to finding the right place to play, you’ll be hard pushed to find a better option than Slots Deck.